Sandy Powell’s Startime; Cyril Fletcher’s Summer Masquerade; Hedley Claxton’s Gaytime; The Fol-de-Rols. 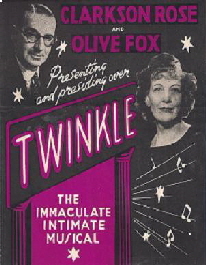 Clarkie and his partner Olive Fox presented their first Twinkle on Ryde Pier in 1921. Over the following 47 years Twinkle had resident summer seasons, with tours in the spring and autumn. In the winter months Clarkie was one of our busiest and best-loved pantomime dames. ‘eased the passing’ of perhaps 140 of his elderly female patients. Olive never liked him: I wonder why? The original Eastbourne version of this talk is probably of more interest to those in the south-east. In 2016 I was asked by Barnstaple U3A for a ‘study day version’ of this talk more relevant to audiences in the south-west. the last summer season in Exeter’s Theatre Royal. Twinkle’s own final summer season, in 1968, was in Teignmouth. The south-west had its own thriving seaside entertainment scene - all covered in the Barnstaple version of this talk. Both versions are presented as a ‘solo performance’ with costumes and props, some songs and a dance. There is some audience involvement. Oh, yes there is. It therefore needs a ‘performance space’ - not necessarily a stage - and cannot be done from behind a lectern or dining table. And a hands-free microphone, please. In 1585, when Armand-Jean du Plessis (later Cardinal de Richelieu) was born, France existed only as a geographical area: neither language nor law provided any unity. Loyalties were feudal, religious and/or regional. Richelieu dictated both the military strategies which provided France with new defensible borders, and inaugurated the unifying reforms which moulded the state’s own national cultural identity.In the process Richelieu discovered the power of cultural propaganda, and sought control of the country’s literary and artistic activities and institutions.Working closely with the royal architect Lemercier, the Cardinal planned buildings of enormous extravagance, including the church at the Sorbonne, where he was proviseur, and the magnificent Chateau and ‘walled town’ on the family estate at Richelieu.The Palais-Cardinal in Paris (later the Palais Royale) included a theatre, and he collected paintings and sculptures by many of the outstanding artists of the time, now on view in Paris, Orleans and Tours. He also founded the Academie Francaise. left: the Sorbonne church in Paris. A semi-staged canter through the life, loves and writings of “the greatest playwright since Shakespeare” told, as he himself always told it, with a whimsical sense of humour. Details and Reviews of this ‘semi-staged’ Presentation can be found on the G B SHAW page. TWO POWERPOINT PRESENTATIONS which ‘really do need pictures’. Kingsbridge U3A: Another blistering success - gave a terrific depth to the subject.